I tested five different external microphones, plus the TRV900's internal microphone. I used 16-bit sound mode and manual mic level control. Each sound snippet below is in two parts: my voice announcing the microphone type, and a brief excerpt from a guitar piece on CD, played through my Aiwa CX-NA71 (cheap) stereo. Voice part: I am speaking three feet in front of each mic (except for the lavalier mic which is clipped to my shirt). Music part: the two stereo speakers and the mic form the vertices of an equilateral triangle 3 feet on a side. The music sound level (SPL) at the microphone position was 64 dBa, 68 dBc (RS#33-2050 sound level meter, calibrated, slow average setting), and my voice is somewhat quieter. All this was done in my living room, a space of no particular acoustic merit. All the audio was transferred along with the video digitally via firewire to my PC. The voice part and the music part were normalized (gain digitally increased to max. without clipping) separately in CoolEdit96. Since my voice is quieter, this makes the background hiss proportionally louder. I left one second of silence after I stopped speaking and before the music, so you can listen to the background noise. The sound clips are stored in MP3 format at 128 kbps (compressed but "CD quality"- even with good headphones I can't tell any difference between the original and the MP3. If you use an editor and sample-by-sample subtract the MP3 from the original, you see all the differences are at least 35 dB down.) Each clip is about 8 seconds long and about 150 kbytes in size. If you don't have a MP3 player, you'll have to download one before you can hear the examples. I formerly used MusicMatch, and now I use Cool Edit 2000, but there are lots of others. By the way, my web page has limited bandwidth, so please download to your local disk just once, and play them from there. TRV900 The Sony TRV900's internal stereo mic is not too bad, and is certainly the most convenient microphone to use. TR7000 The Sony TR7000 Digital 8 internal mic is here for comparison. This camera does not have manual level control (auto-AGC only). You can hear the motor noise in the background. TRV10 The Sony TRV10 MiniDV internal mic, using auto-AGC. The motor noise is very faint. ATR55 An external supercardioid "shotgun" mic ($80), here held loosely in a shoe mount sized for a different mic. It has two settings, supercardioid (tele) and cardioid. The voice was in tele mode, the music in cardioid mode. It's the least expensive supercardioid I know, but I find it a bit noisy. Sima A small $20 tie-clip mic from Sima. Unlike all the other examples, the voice segment has lower background noise than the music, because in this case the mic is clipped my shirt where it is much nearer to the sound source. With microphones, just like with real estate, location is everything. All small electrets are relatively noisy, which you notice on the music section- of course, you wouldn't use this mic that way. RS Mic Apart from lavs and bare elements, Radio Shack carries just one condenser mic: RS# 33-3017 ($50). I have it mounted on a separate mic stand with the XLR-type cable to my XLR-PRO adaptor mounted underneath the camera. I think this mic is rather noisy. E100 The Equitek-CAD E 100 "studio electret condenser" which has a bass response flat to 10 Hz, self-noise of 16 dBa, supercardioid pattern, and list price $469 (but cheaper at Abe Music). It is on a separate mic stand (could not be shoe-mounted) and the XLR connector plugs into the the XLR-PRO adaptor. The music (impinging at 30 degrees from either side) sounds a bit wrong due to "off-axis coloration"; this mic is directional and sounds more natural when aimed directly at the sound. I suspect the background noise is mostly the TRV900 internal preamp; an external mixer would do better. [note Dec. 2003] You can currently buy a Rode NT1-A with 5 dBa self-noise for under $200. Technology marches on! What's the conclusion? Well, have a listen, and the decision is really up to you.... Of all the recordings from the TRV900, the quietest background for the voice part was from the cheapest (and intrinsically noisiest) mic, the Sima lavalier/tie-clip, demonstrating the importance of mic placement. (Of course, as you hear on the "original" clip voice intro, the E100 outperforms it when used close.) All things being equal I do like the most expensive mic (E100) but it's a "studio condenser" and a bit awkward to use anywhere but a studio. I also have the Sima stereo shoe-mount mic, but it's worse than any of these shown above. The MS908 is compact and a reasonable value, but an isolation mount would be handy. I actually took it apart and wired in a longer cord for more flexible mounting options. If you do this, take care to use a well shielded cord to avoid hum/noise pickup, or simply choose the ECM-MS907 which is the same mic but with a different mount/holder, intended for MiniDisk and DAT recording. It has a 5 foot cord so you can put it closer to the subject. Remember, with microphones as with real estate- location is everything. I tested three different lapel mics. Each mic was placed in turn on my shirt at my second shirt button, which is 10" from my mouth. I recorded myself speaking in a normal tone of voice, in my living room. Recorded direct to Sharp MD-DR7-A (pocket-size minidisc recorder) in normal/mono mode (not LP/LP2). Transferred digitally to PC, encoded to MP3. Sima clip-on with 20' cord, and built-in battery. Seems a little noisy, but decent frequency response. Sony small stereo lapel/table mic for plug-in power, was bundled with Sony WM-D3 walkman tape recorder. Noisy and harsh (poor low-frequency response). Audio Technica MT830 lapel mic for plug-in power. Nice quality and much lower noise than the other two. To hear the low-frequency response of this mic, listen to this Jet-Takeoff.mp3 on a system with a good low-end. 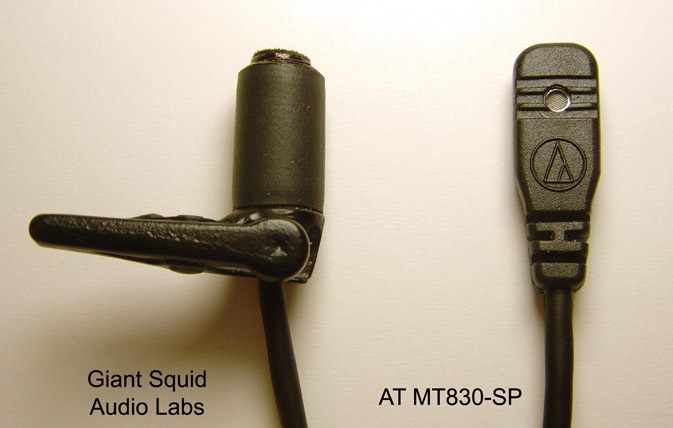 The mic is labelled as MT830-SP which in 2003 was $80 from SoundProfessionals.com. The AT MT830 sounds much better than the other two mics to my ear. Note its good low-frequency response could be a liability unless you have a separate bass-cut filter: barely audible footsteps from the upstairs neighbor caused the input to saturate due to the low frequencies. You can see from the waveform in the PC that my apartment ceiling resonates around 12 Hz. I used the MT830 + minidisc to record ambience and chamber music at a wedding and thought it sounded decent. 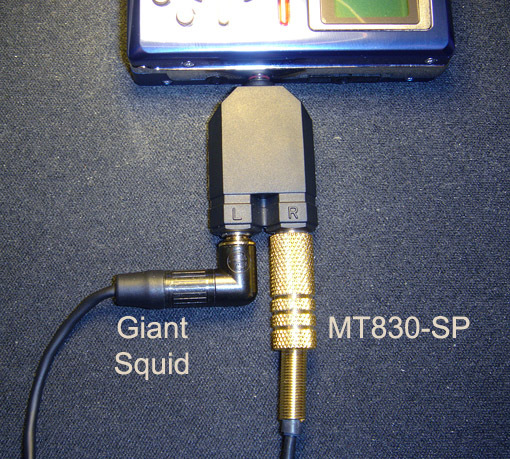 The Giant Squid Audio Lab lapel mic is worth a look. It is less expensive than the MT830, it has about 5 dB more signal than the MT830 when they're in the same location, and I think the sound is at least as good. Here is an unprocessed comparison recording from both mics at the same time. MT830 mic, GiantSquid mic, and both at once (stereo). Here are photos with and without a windscreen on the MT. 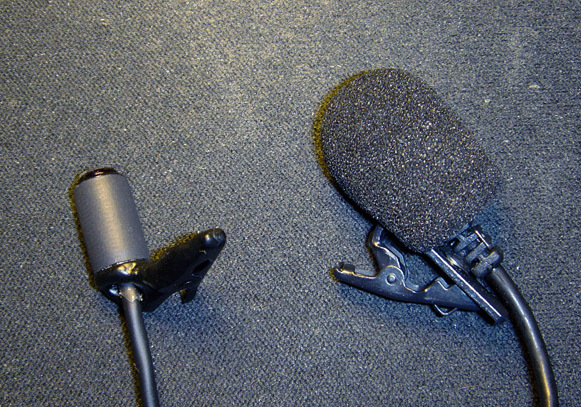 My version of the GS mic has a right-angle plug as you see here. The MT830 had the windscreen on in this comparison test but I also tried it without; the screen seems to have no audible or measurable effect (when the wind isn't blowing). Here is a sample of the GS mic + iRiver FP890 (pocket mp3 recorder). The iRiver mic input is somewhat noisy, with a rapid clickety sound in the background that reminds me of night insect noises.